Map of Sweden and Norway. 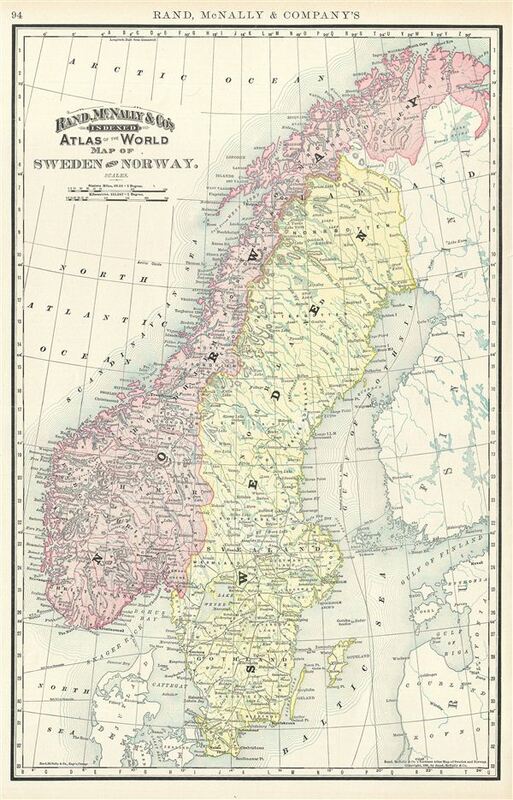 This is a beautiful example of Rand McNally and Company's 1891 map of Sweden and Norway. It covers from Finmark in Norway to Gothland in Sweden. During the latter half of the 19th century, due to Sweden's predominantly agricultural and hence poor economy, large numbers of its population immigrated to the United States. Color coded according to regions and territories, the map notes several towns, cities, rivers and various other topographical details with relief shown by hachure. This map was issued as plate no. 94 in the 1895 issue of Rand McNally and Company's Indexed Atlas of the World - possibly the finest atlas Rand McNally ever issued. Rumsey 3565.023 (1897 edition). Philip (atlases) 1026 (1898 edition).